Thrangu Rinpoche, Sogyal Rinpoche, Kalu Rinpoche, Chökyi Nyima Rinpoche, Tulku Urgyen Rinpoche, Chimed Rigdzin Rinpoche, H.H.Karmapa Rikpej Dorje XVI., H.E. Jamgön Kongtrul Rinpoche, H.H. Dalai Lama, Choegyam Trungpa Rinpoche, H.H. Dudjom Rinpoche, Chagdud Tulku Rinpoche, H.H. Dilgo Khyentse Rinpoche, Khenpo Tsultrim Gyamtso Rinpoche, H.H. Dzongsar Khyentse Rinpoche, Sakyong Mipham Rinpoche, Lama Yeshe. It is a commonplace in modern western societies, to view our own scientific and technical heritage to be superior compared to other cultures - this might be the case in terms of our materialistic development. 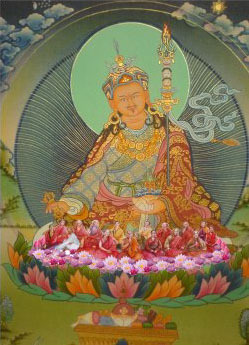 But viewed from the point of view of the development of the sciences of mind and spirituality, the buddhist teachings could be seen superior to our own cultural heritage within those disciplines.It is due to the lack of familiarity with the precious content of those broad variety of precious teachings, that a majority of people in western countries hold themselves still superior on all levels of education, including mind-training. It is due to the united efforts of many buddhist female and male practitioners, teachers, yoginis, yogis, lay and monastic people, that at the present moment we still have access to the rich heritage of those foremothers and forefathers of the different buddhist vehicles. We want to open the doorway to those precious treasures of teachings, which are a gift for the transformation-process of confusion into wisdom, so that all aspirations of the wisdom-holders of the different ancient cultures will be fullfilled.